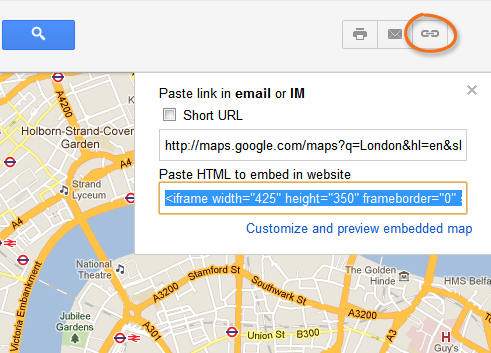 We’ve just upgraded our Google Maps widget to support embedding. If you go to a Google Map in your web browser, you can click the “Link” icon (as indicated in the image above) and then copy the embed url. Then click ‘edit’ on a Google Maps widget on your Protopage and paste this into the “Web site address” field. Click save, and your Google Map will then appear on your Protopage! This entry was posted on Tuesday, September 27th, 2011 at 4:58 pm	and is filed under new features. You can follow any responses to this entry through the RSS 2.0 feed. Both comments and pings are currently closed. Thanks for the update, I will use this quite a lot for having maps for different areas I need quick access to in future. Will they appear in the same size as specified in my map?